Loss in Weight Augers | PAK Automation Ltd.
Loss in Weight Auger systems are ideal for accurate measurement of dry bulk materials. PAK Automation offer several Loss in Weight Auger systems. The loss-in weight system works as follows: product discharge rate is measured by the amount of product lost within a hopper over a certain time period. Normally the weigh auger comprises two screws , one feeding and one conveying. The pre-feeder can be replaced by another type of feeder (rotary valve, belt conveyor, chain conveyor, etc) as long as material is fed consistently and reliably to the lower weigh auger. The advantage of using the loss in weight auger is that the product is never exposed to the atmosphere. This prevents contamination by liquids or foreign bodies and provides a dust free environment. Loss in Weight Augers are variable speed machines. Weight throughput is linearly proportional to the belt speed or screw RPM. 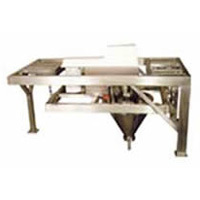 Variations in weight through changes in bulk density are monitored by the scales and speed is calibrated by the PLC to ensure the correct weight. Once the preferred weight is input, the weigh system will maintain it indefinitely with an accuracy of up to +/- 2%!